Recreate the runway with this easy tutorial in Cricut Design Space with heat transfer metallic foil vinyl – perfect for the purest of Cricut virgins everywhere! This post contains affiliate links. Okay so, I have been trying to make today’s post for quite sometime, like since March when I was in Paris… So why hasn’t this come along until now? Welllll…. I have tried this multiple times and multiple times it has failed. BOO. So you know, I did what every craft loving person did and put it off to the side. Not quite forgotten but removed enough so it didn’t bum me out but ya know, close enough to be awarded back burner status. And if you have no clue what I have talking about, let’s check out Dolce & Gabbana’s 2017 spring collection. Oh baby, I’m obsessed with what I see there. The colors, the textures, and those tee’s – they are so bomb. Naturally, I figured I could find an easy graphic top that said all the right words right? NOPE, most the lettered tees were gross – word and design wise, . Visit Design Space and make your graphic. Mine is a bit silly in the sense that I am wearing a shirt with my name in the front… But you don’t have to go there because there’s so many ideas that would work! Play around with initials for the first line, special days/years for the second, and on the third line – make it personal. Mine said, “Designer, Blogger, Fashionista”. Another idea is to play around, especially for teens, it could be the School abbreviation, graduate year, and something descriptive. But see how far that pesky “A” is away from the other letters? Grrrr…This has got to change! So I moved it by breaking up the word by clicking on the word you want to adjust, select: “Advanced”, then select: “Ungroup Letters”. This will make every letter an individual letter instead of it forever combined the way it is in Microsoft word. Figuring out how to use this program have been lot’s of fun and really easy to use for a first timer like myself! Using the rulers as a guide, decide on the size of your project before selecting “GO”. When you are cutting, select the “foil iron on setting on your machine” and “mirror” before before you cut (on your screen). You can find an easy tutorial here as your guide, HERE. Next, you want to Iron on your foil according to Cricut Iron-On application instructions… For those afraid to but your hot iron on the plastic, DO NOT BE AFRAID. It was so cool and crazy because it never melted! Then allow the plastic shield to cool completely before removing. The foil is supposed to be one of the harder vinyls to work with and I found it pretty easy – so I’m putting all my cards in and betting the regular colors are a snap! THEN, once you have finally pulled yourself away from your newest master piece and stopped showing everyone and their mom, we need to finish our look! Hello, remember? Dolce & Gabbana is still waiting to be recreated, my darlings! So next step, cut from your roll of 1″ grosgrain ribbon as many bows as you can make! Then tack them in place with a matching black thread and hand sewing needle. this is something that you can eye ball, it does not have to be perfect. REPEAT: this does not have to be perfect but organic and naturally appearing as if those bows sprouted all over your collarbones. It should look similar to this (below). So, anyone wondering WHY I used Silver instead of black? Easy, because I wanted to. I appreciated the newness of the foil iron-on and it’s SILVER. How cool is that?! I love glam and I loved how it gave the edge of the grapghic without overpowering. The bows are fun. I LOOOOOVE bows, this D&G tee was something I instantly gravitated towards. So now that you know how to recreate this look, WHAT would you do differently?And if you do not currently own a Cricut, do you want to try to win one? It cannot hurt to give it a try. I do it all the time. Having the opportunity I have to share with you about this super cool machine was a chance I took, too! I am so happy to announce that Cricut is giving away one of these amazing machines to one lucky reader! All you have to do is click the link below AND meet some of my new friends I get to rub internet elbows with they are such a talented group of makers and shakers! So whether you craft with me over here, or another one of these amazing bloggers, I promise you are gonna find somwthing you love… almost as much as mine, right? Thanks so much for visiting darlings, until next week! WHOA WHOA WHOA!! without sounding like Bob Barker from the Price is Right… THAT’S NOT ALL! 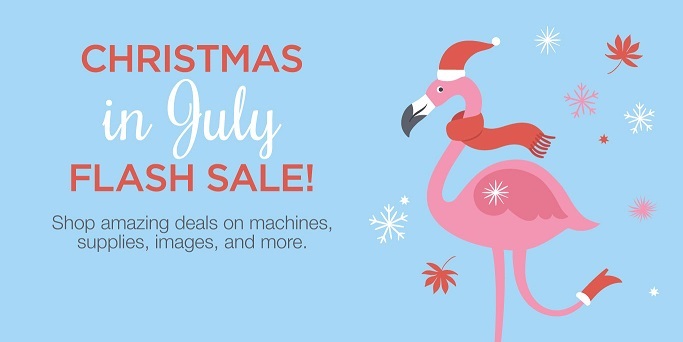 Haha, I couldn’t resist… can we talk about the Christmas in July Sale going on? So cute!!!! I have the Cricut on my list as the next addition to my crafting supplies. I love wth you have done here!